What is this? Two posts in one week? Shut your mouth! Yep, it’s true, I finally got myself focused and am getting things done. 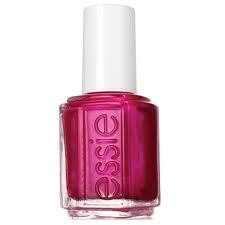 When finding motivation, one must find a color to match, and I found a color that screams, “getting’ it done!” Essie’s Sure Shot from the 2012 Resort Collection. Now, I’m not exactly sure how one is supposed to take the name Sure Shot at a resort. I guess it means different things to different people, but Essie, how you make the mind wander. Onto the review! 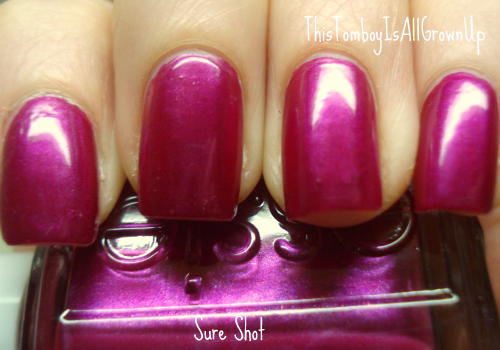 Application: Sure Shot is a two coat polish which is pretty standard for most formulas. The application was pretty good though a little bit on the runny side though not enough to make life difficult which is always a plus. The Color: Anyone who knows me well knows I LOVE colors like this. Sure Shot is a bright magenta that is sure to get you noticed, as there is nothing timid about this color. Sure, magentas are pretty common, right? Well, yes! But Sure Shot is unique for its flashes of bright pink shimmer. Ah, yeah! The Verdict: Love, LOVE, LOVE!!! Am I biased? Yes. I will never walk away from a color like Sure Shot and I have tons of colors like this to prove it. But what makes Sure Shot unique is the bright pink shimmer which flashes in the light. It really is quite pretty and a perfect spring alternative to the bright reds of winter. The formula is great, the wear time is good, and the color is vibrant just like the spring. Tour de Finance. I can relate. I’m taking a crash course. I’m an actor and all around artist who has decided to take a finance job for a while that brings me the finer things in life. Or rather, the things that many with a “real” job take for granted: health care, a steady paycheck, a structured schedule. Well, two out of three ain’t bad I guess. But I won’t lie, getting used to the whole corporate thing has been quite the challenge, especially when it’s finance. That’s why when I saw Essie’s Spring 2012 “Navigate Her” line which nods to the world of finance I had to laugh and cry at the same time. Ah finance, you may pay my bills but the trade off is long hours that cut into my pursuits of jazz hands. So this, this is my nod to you Corporate America: Tour de Finance! The Application: No complaints here, smooth sailing with Tour de Finance. Easy application and perfectly opaque in two coats. Isn’t life grand when things work out easily! 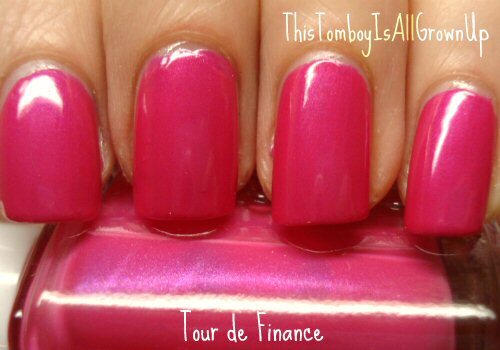 The Color: Tour de Finance is a mellowed fuchsia with fine blue particles shimmer. Ooooh aaahhh. Just to clarify, “mellow fuchsia” means it’s more of a medium fuchsia, not the darker more blinding type that can take out your corneas. I personally like both, especially the brighter kind. I hear they can work miracles with eye surgery! Is Tour de Finance something we haven’t seen before? No, not really. It’s pretty dupable. But if you don’t have a color like this in your collection yet, then this is a mighty fine one to have. The Verdict: I like Tour de Finance, I do. I even wore it to my fiance job to see if it made me feel like a powerhouse executive. It did not! I still had to pick up the phones for my boss while dealing with travel and expenses. Still, it was a pretty fuchsia that got a lot of attention. Is it my favorite fuchsia? No, but it’s definitely pretty, just overdone. After a few days, I decided to spruce it up as I get bored easily. Take old mani, add Essie’s As Gold As it Gets, and Voilá! You have a winner (see pics below)! 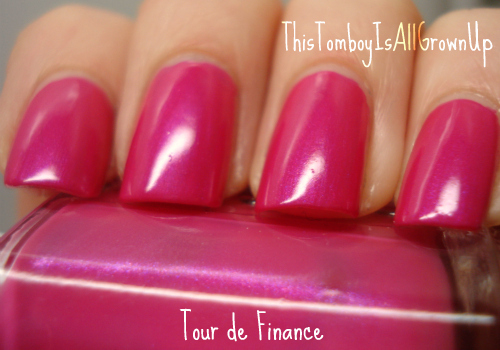 Either way el natural or with added pizazz, Tour de Finance is a solid eye catching polish perfect for spring. It even lasted five full days with only a little tip wear. I am so ready for the light, fun colors of spring. Especially after this week’s fabulous weather in NYC, 70 degrees! But yes, I am still wearing the ever popular dark colors, specifically Armed and Ready from Essie’s Go Overboard collection. It’s time to let go of the dark colors soon, but so many companies keep releasing such cools ones this late in the season that I can’t resist. What is a girl to do? Keep trying them all even when the lighter colors beckon. I hear your call Armed and Ready, I hear your call. The Application: I found the formula of Armed and Ready to be slightly on the runnier side making it a little hard to work with. Not too big of a deal, but I did have to pay more attention when applying as I hate a sloppy manicure (like anyone likes a sloppy manicure)! In the end, with a lot of concentration, I had a decent manicure that was opaque in two coats. Yay! 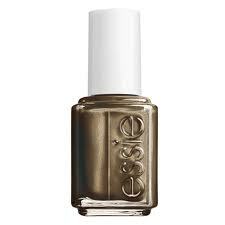 The Color: Armed and Ready is a dark grayish, olive green with gold shimmer. Yes, it sounds amazing and I couldn’t wait to slap it on. Unfortunately, for me, the gold shimmer was not very prominent and was only really visible when I was under bright lights or was specifically looking for the gold shimmer. I felt like Lucky looking for his lucky charms after the rain had passed only to find I had struck out. Wow, where did that come from? The Verdict: If you’re looking for a dark military green, Armed and Ready is a good color to pick up, but if you already have a few, I don’t think you will really need this one. 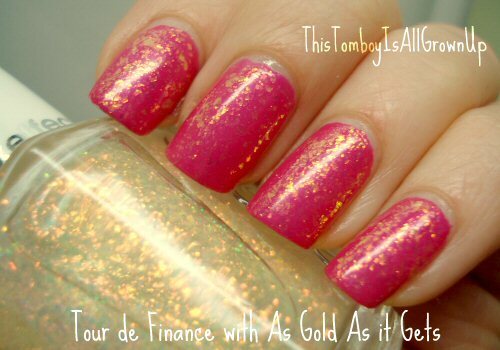 It’s nice, but nothing really special even with the gold shimmer thrown into the formula. It just wasn’t enough to elevate it to that “wow” level. Side Note: Because I was craving the gold, I decided to fix up Armed and Ready with a little help of Essie’s As Gold as it Gets. One way or another I would find my pot o’ gold and I did. I have to admit, I really loved this combination. Check out the photos below! Tine for the spring/summer collections to start rolling in. These are my favorite collections of the year because it means warm weather is on the way! That’s what I’m talking about! Immediately, I liked the name of the collection because going overboard pretty much sums up a good part of my personality. As usual, this collection will just be a sneak peak, but during the next few weeks I will take them for a test drive to check wear and tear and if I lose interest or not after applying it. I was a little bit disappointed with Essie’s Lilacism last year because I have to be honest, I found it chalky and a pain to apply. Play Date is exactly what I was missing with Lilacism. 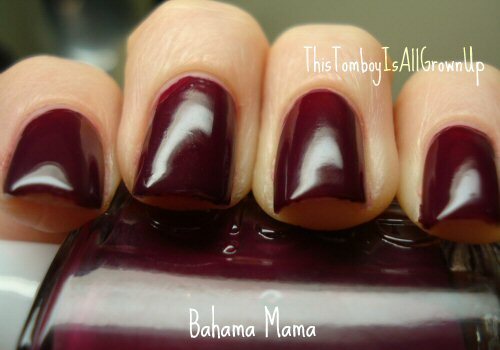 It applies smoothly, is glossy, and one pretty soft purple! It’s feminine and delicate, something I usually don’t go for, but this just screams spring. It took only two coats for a perfect application. If you want to make a statement, then slap on Go Overboard and be on your merry way, because there is no missing this polish. 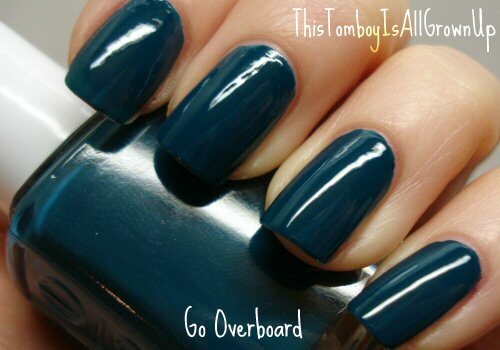 Go Overboard is a flashy teal polish that was practically opaque in one coat. Not bad! Unfortunately, it did leave a little staining after removal. I don’t always use a base coat when swatching and with this one, I probably should have. Now I love bold colors, but this one maybe too much for me. I know, I didn’t think it was possible, but here we are! I may save this one for pedicures only because I can’t see myself wearing this too often on my fingernails. I know, killjoy! This one was a surprise for a spring collection. Armed and Ready seems more like a winter or fall color as it’s a grayish, green polish with gold shimmer. Still, I was excited to try this one thanks to a the addition of the gold shimmer. I have to be honest, the shimmer isn’t really visible unless you are looking for it or if you happen to be in bright light. Disappointing. This is the polish I decided to keep on for my manicure right now, but I think I may need to spruce it up. I know this is crazy, but out of these bold colors, my favorite is the one that won’t be turning too many heads. I really love this purple! Go Overboard will most likely be a fan favorite for many, while Armed and Ready will probably not disappoint as long as you know the shimmer is very subtle. All in all, I would give this collection a solid grade of a B. This Sunday I decided to go for what would most likely would be my last deep, reddish color of the season. This was before March 1st mind you. Originally hailing from California, I’m a huge fan of of spring and summer, so once the beginning of March comes, I’m onto the fun, bright colors of spring. I’m an optimist! So to bid the winter vamps goodbye, I pulled Bahama Mama from my untried stash and began applying it while watching The Walking Dead, again. The lone zombie in the field spoke volumes without even saying a word. I feel your pain Shane. Onto Bahama Mama! The Applications: I had been warned about Bahama Mama but didn’t want to believe it. I think a person should never pay attention to rumors about something or someone until they are able to make their own opinions based off of their own experience. Well, I experienced Bahama Mama, and the formula was el stinko. It was streaky, had a poor consistency and was just too hard to work with. It took three coats to correct most of the unevenness of the prior applications and even after the three coats were applied, I could still see light spots where it didn’t cover correctly. Nightmare! The Color: I have to be honest. 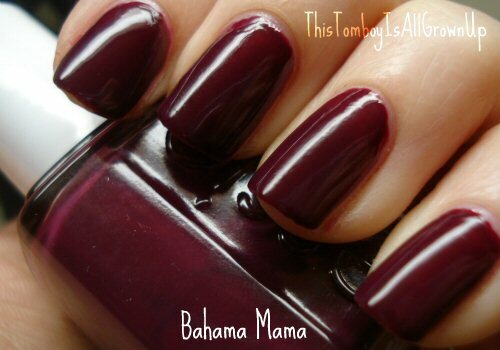 I’m so disappointed that Bahama Mama applied so horribly, because the color is beautiful. It’s a raisin color leaning a little bit more towards crimson with a jelly finish. 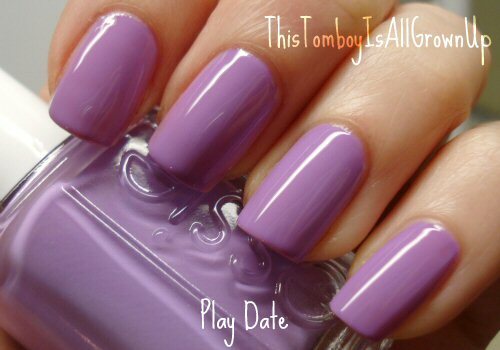 I love colors like this but because the application was so horrid, it looked sloppy. The Verdict: Uh, no. 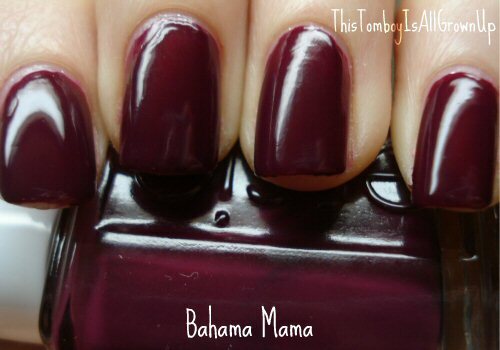 I loved the color of Bahama Mama, but the formula was inexcusable! It really was that bad. If you look closely at my photos, you can see where the application is sloppy and how the color is uneven. Now, I may not have the steadiest hand when it comes to painting nails, but I’m not as bad as these photos make me appear. Maybe it was the batch I received, but I have heard of others having the same problem with this specific polish, so I have a feeling it’s the overall formula. 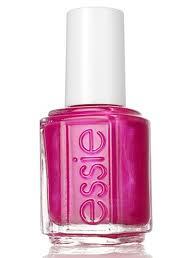 It really is a shame because Essie could have had a winner with this one. I ended up removing it the same night because I just couldn’t go through the week with such a sloppy manicure. Oh the humanity! Bahama Mama - Yikes to the Application! What a perfect color to be sporting the past few days, especially today. Yes, it’s a sad, sad day as my Packers will not be going to the Super Bowl. This Tomboy is All Wound Up after that game and not in a good way. Oh Pack, no! 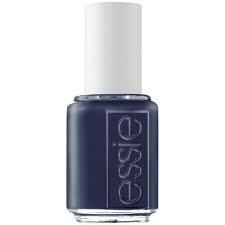 Anyway, Essie’s Midnight Cami is the perfect color for my mood right now. 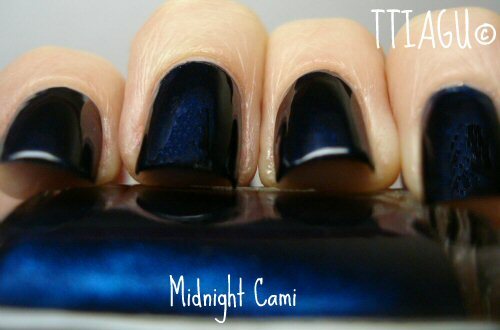 The Application: Midnight Cami went on perfectly as the formula was a dream. One coat was nearly enough to make Midnight Cami opaque which was quite impressive, though there were a few light spots, so two coats is the best approach to this polish. 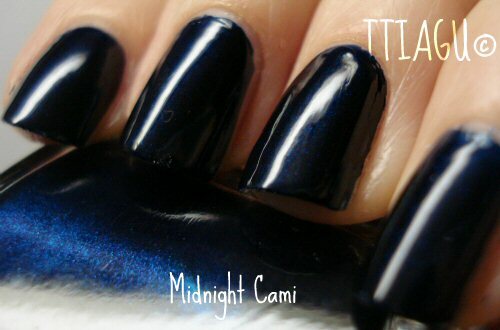 The Color: Midnight Cami is well, a dark midnight blue, with a light sprinkling of a slightly lighter, bluish glimmer. Surprise! 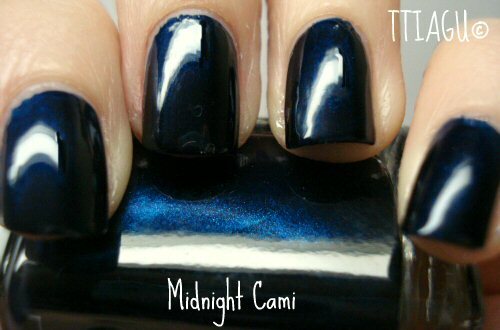 Midnight Cami is so dark that in some lighting, it almost comes across as black. Very odd and unexpected. It has a nice, shiny finish even without a topcoat, but I recommend one anyway. It’s time for Essie’s 2011 Holiday Collection! I know, it’s not even October yet, but this collection is so special, I couldn’t wait once I received it. 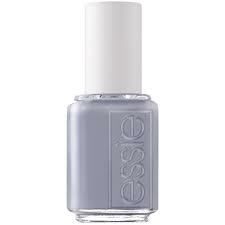 Essie is usually know for neutrals with an edgy color here and there but this collection changes all of that. The Holiday collection has a couple neutrals, a red and a few new colors to keep you on your toes! As usual with the collections, I will do a quick review and go into more detail as I wear the colors throughout the season. Here we go! I won’t lie, I was afraid of Brooch the Subject when I first saw the color as it reminded me of Case Study from Essie’s 2011 Fall Collection. Case Study had a tinge of green which didn’t work for my skin tone. Brooch the Subject? Gorgeous! I’m not a huge fan of neutral tans, but this one gets a thumbs up! I really wanted to find some reason to dislike Brooch the Subject but in the end, I just couldn’t. This color is perfect for the neutral polish connoisseur or for those in need of an appropriate, yet stylish interview or work safe nail polish. My only complaint was that the formula was a little streaky, but it did fix itself with the second coat. Bangle Jangle is another work friendly color unless your work place frowns on anything that slightly goes outside the realm of a neutral. Bangle Jangle is a delicate, creme, lavender with a hint of blue making it very color friendly for those who normally can’t wear lavender successfully such as myself. 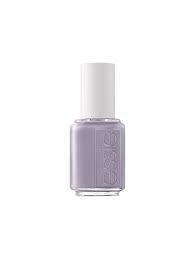 Essie’s Lilacism didn’t work for me due to its almost chalky nature, but Bangle Jangle is pure perfection. The formula was smooth and easy to work with and for the most part opaque after two coats, though three would probably work best for Bangle Jangle. Anyone who knows me knows I love the singing the blues vocally and on my fingernails. Well, this color did not disappoint! Cocktail Bling is a light grayish, blue creme with no bells or whistles, it doesn’t need them the color is so pretty. Cocktail Bling is a versatile blue that would work for a night on the town, day to day life, or even at work as it doesn’t scream “look at me, I’m wearing blue!” Yeah, I love those blues too! I really do! But sometimes, you need to bring it down a notch and this is the blue to do it. Yep, you win again Essie! Yes, this one will be pretty popular from this collection because it’s flat out awesome! School of Hard Rocks is a forest green with a tinge of blue to add a little spice. This color would be great for so many skin tones thanks to it’s blue and green undertones. The formula is perfect and the color is just so special and unique. This one may be my favorite of the collection! Why, yes I am! Bobbing for Baubles is a dark blue that is the perfect choice for those who fear black. It’s dark, it’s edgy and I’m in love. 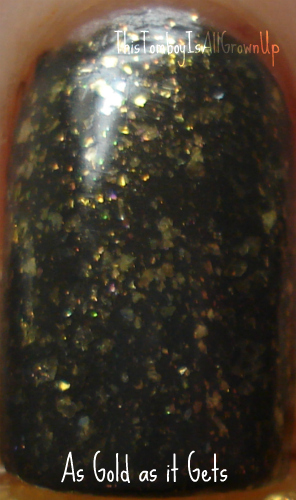 It is similar to Zoya’s Cynthia, so if you have one, you may not need the other. If you don’t have Cynthia, get thee Bobbing for Baubles! The formula is easy to work with and the color is fantastic! These pictures do not do Bobbing for Baubles justice! I will be redoing them this weekend because I was a bit rushed due to school and life in general today. Bobbing for Baubles deserves better! When I saw Size Matters I wasn’t overly impressed as it appeared to be just another red creme for the Holidays. Ho hum. Well I was wrong! After wearing it, I was in love. Size Matters is a deep, cherry red with a gorgeous shine to it. It’s insanely pretty! This is one of the best reds I have run into in a while and it’s not just for the name, though it does amuse me to no end. Mama, I’m in love! All in all, I love this collection. Unlike Essie’s 2011 Fall Collection which left me a little underwhelmed, Essie’s 2011 Holiday collection makes up for it as there isn’t a weak color in the bunch. Except for Brooch the Subject’s slightly streaky formula, I really have no complaints and will be keeping the entire collection which is a feat for me. A+ Essie on a fabulous Holiday Collection!